The MOBILEYE Collision Avoidance System is a driver assistance system integrated with telematics capabilities. Acting as an ‘extra pair of eyes’, the system alerts Bus Captains to vehicles, pedestrians and cyclists on the roads with visual and audible alerts, helping to reinforce safe driving behaviour and reducing the chance of accidents. The Mobileye system is just one of many Advanced Driver Assistance Systems (ADAS) available on the market. Currently, local bus operator SBS Transit is progressively installing the Mobileye system on all its buses, and SMRT Buses have installed Mobileye units on its Training Buses. 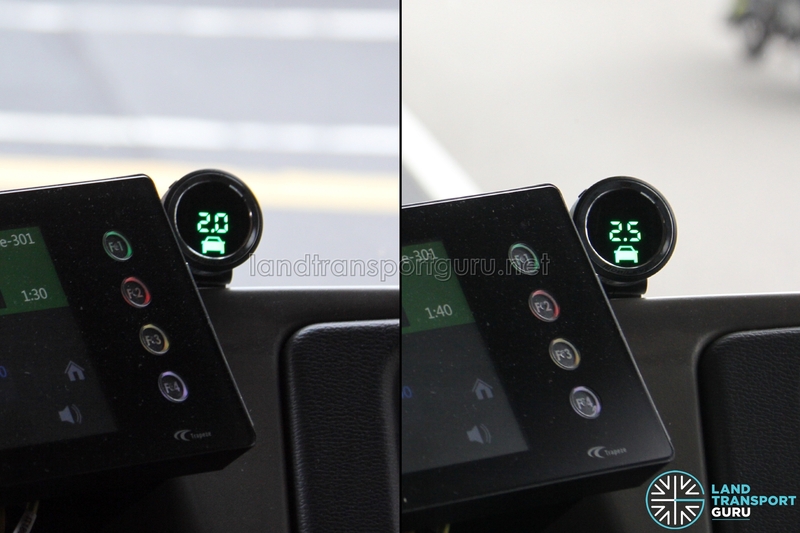 As of May 2018, Go-Ahead Singapore was observed to be installing Mobileye on its buses. 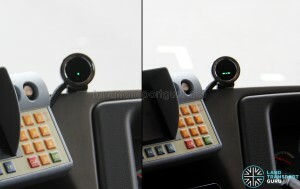 The conventional front-facing Mobileye camera paired with a display unit is the Mobileye 560, and its newer counterpart is the Mobileye 630. The enhanced Mobileye Shield+ Collision Avoidance System was also trialled starting from January 2017, featuring vehicle blindspot protection. This article seeks to cover the basic functional aspects of both systems. 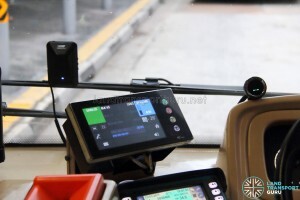 The system is also installed onboard SG5999Z, LTA’s trial MAN Lion’s City DD Concept Bus, and SG4003D, a Volvo B8L Demonstrator. 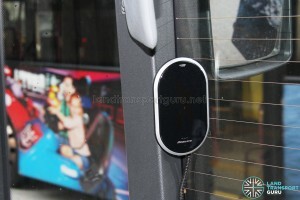 As of January 2017, it has been installed on Mercedes-Benz Citaro, Volvo B9TL Wright and Scania K230UB buses. 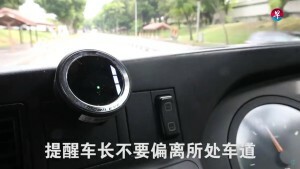 The Mobileye system was first promoted by the Singapore Transport Association in May 2014 in a bid to reduce road accidents involving heavy vehicles. The system signals if one’s vehicle is crossing lanes, going too near a vehicle or pedestrian, or driving above the speed limit. 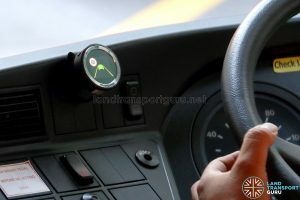 Real-time data can also be sent back to the office via GPS so that companies can capture the driver’s behaviour. While the Mobileye setup (including the monitoring system) costs S$2,675, Singapore Transport Association members get up to 70 per cent subsidy under SPRING Singapore’s Capability Development Grant limited to 30 vehicles per company. 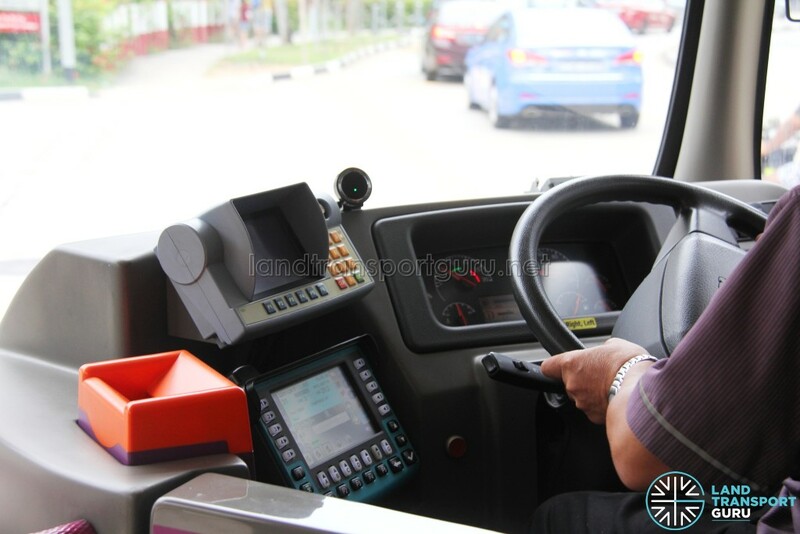 SBS Transit first introduced the Mobileye 560 Advanced Driver Assistance System (ADAS) starting in November 2014, beginning with 30 buses, to both complement bus driver training and to trial them on the roads. For training use, the Mobileye system was integrated with the VigilVanguard driver training system, which incorporates motion sensors, cameras and a mapping software, enabling Bus Captains to identify and correct any poor driving habits. 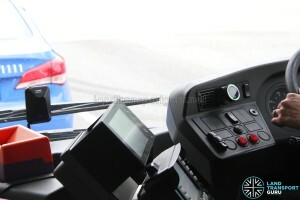 For buses not delegated to training duties, the standalone system was installed. A total of 70 buses were installed with the Mobileye system by Year 2015, along with 30 ComfortDelGro taxi cabs. In the first few months, the Mobileye system was tested in a “blind phase” during which the system was installed and turned on, but the dashboard display unit for bus drivers was not activated. 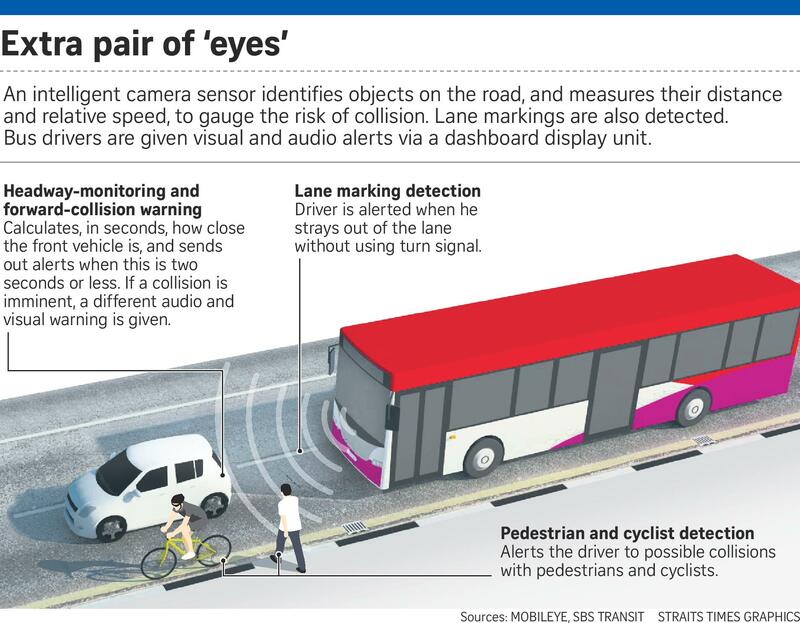 This allowed SBS Transit to gauge the driving behaviour of its drivers by recording the number of warnings triggered by the system. 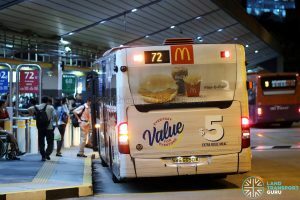 After Mobileye was switched on, and with coaching from instructors, SBS Transit noted a marked improvement in the driving behaviour of its drivers, with fewer triggers logged. In a May 2016 press release, SBS Transit announced that 750 buses would be installed with Mobileye 560 system by that year, and more than 3,000 buses would be equipped with it by the end of Year 2018, with the eventual goal of fleet-wide implementation. Starting from 2018, a newer model (Mobileye 630) was installed instead of the Mobileye 560. In addition, the Mobileye Shield+ Collision Avoidance System was installed on one bus in January 2017 for a six-month trial. The Mobileye 560, Mobileye 630 and Mobileye Shield+ systems are developed by Mobileye, an Israeli technology company founded in 1999. The Mobileye 560 Advanced Driver Assistance System (ADAS) alerts drivers to vehicles, pedestrians and cyclists on the roads, while also featuring a lane departure warning. 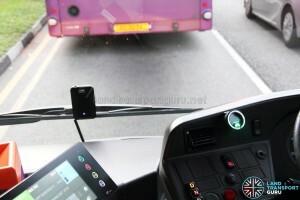 It is the basic Mobileye system installed across many buses. In addition, the system offers Fleet Management System (FMS) integration allowing for Intelligent Event Data Recording (EDR), and connectivity abilities with other external devices using Bluetooth wireless technology. 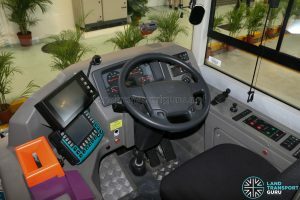 The system comprises a windshield-mounted Vision Sensor Unit (containing a camera and an image processor), a buzzer and a dashboard-mounted EyeWatch Display Unit for visual directional warnings and numerical headway measurement display. 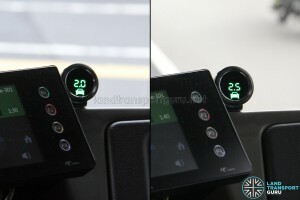 The newer Mobileye 630 offers similar functionalities but elements on the Display Unit are indicated differently. When the Display Unit is turned on and functional, a green dot appears in the middle of the display. 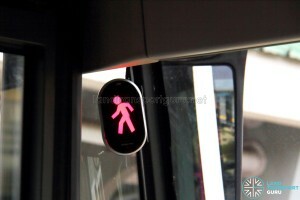 This is the default display when the bus is in motion. When the green dot is blinking, it means that the system has been muted. When the bus is stationary, two bottom lines of the two digits are turned on (thus, indicating zero speed). Displayed when a pedestrian or bicycle is detected ahead of the bus in the same lane. Can also be triggered when a bus enters a bus stop bay, as the system detects people standing near the kerb edge of the bus stop. 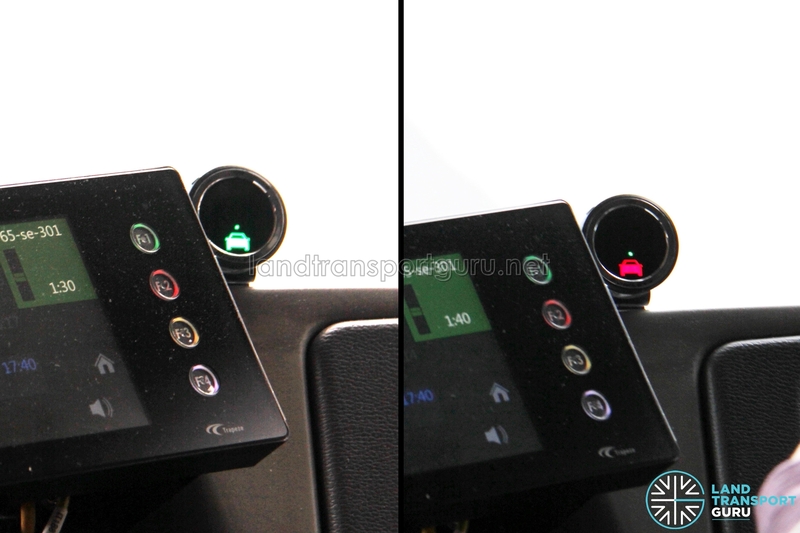 The right image shows both Pedestrian and Vehicle indicators activated. 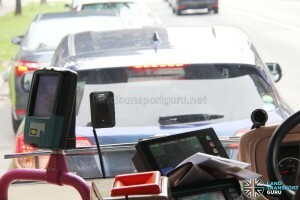 Displayed when a vehicle in the same lane is detected ahead of the bus. Colored Green or Red according to safe or unsafe headway. A two-digit number that displays the bus headway (in seconds) from the vehicle ahead. Only values of 2.5 headway seconds or less are displayed. A warning will be triggered below 2.0 headway seconds, and the Headway Visual Alert (Car Icon) will turn Red. Activated when the bus deviates from a lane when travelling at 55 km/h and above unless the turn indicators (blinkers) have been activated. The right or left deviation alert indicators appear as vertical white dotted lines. Mobileye 560: Lane Departure Warning (Right). Screenshot from Lianhe Zaobao news report. Mobileye reads the various speed limit signs on the roads and indicates them on the display device. This feature is available only on the Mobileye 630. 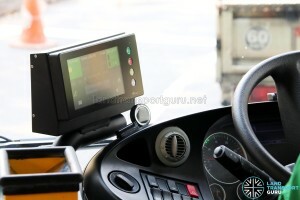 Telematics systems onboard buses are not new. 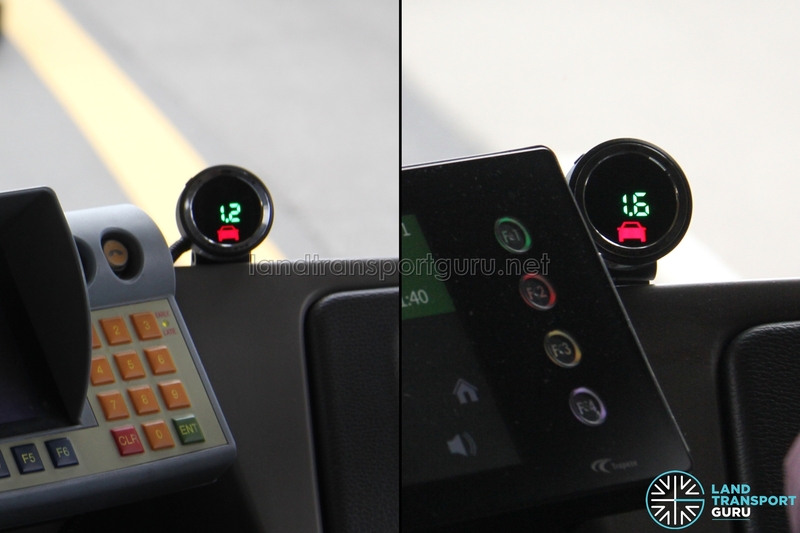 SMRT Buses previously implemented a telematics system developed by NEC Asia Pacific in August 2014, which detects if drivers exceed the 60kmh speed limit, accelerate or brake too abruptly and change lanes or take a turn too sharply. 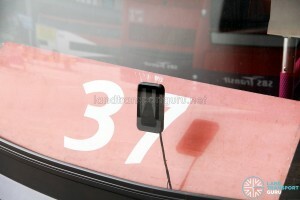 Installed on more than 1,100 SMRT Buses, the system was eventually discontinued after 2016. The telematics capability of the Mobileye system can also identify locations where accidents are prone to happen. 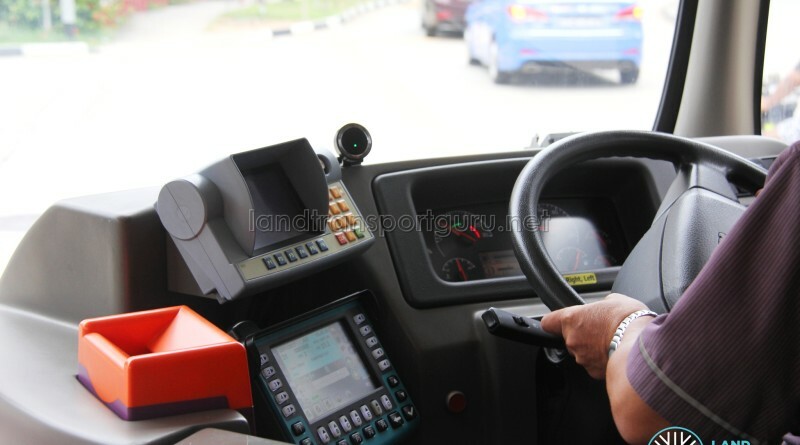 Known as hot-spot mapping, such information can be passed on to Bus Captains by advising them to exercise extra caution around the area, as well as to identify infrastructure deficiencies that can be improved. 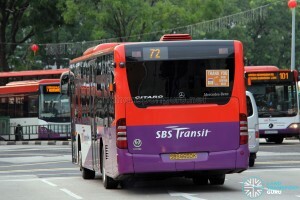 SBS Transit is believed to also be trialling this system. One of Mobileye’s local distributor is Chuan-Fa Auto, which supplied to SBS Transit initially. 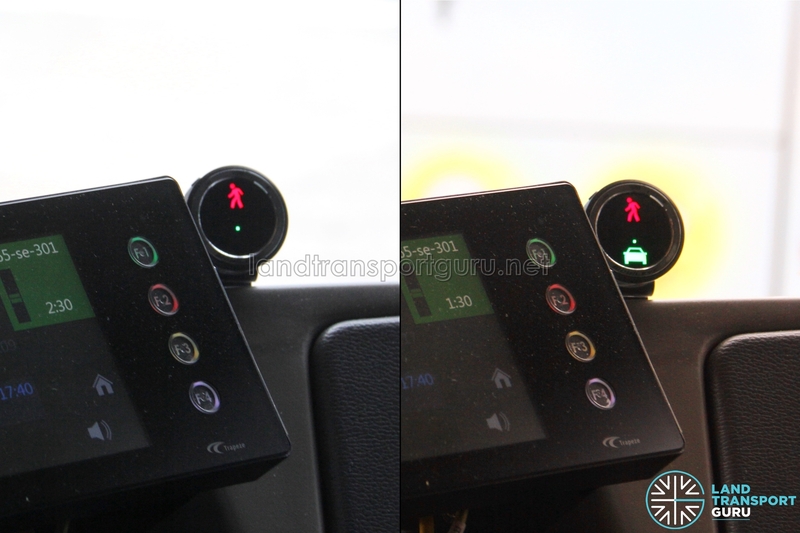 In December 2016, SBS Transit awarded a $1.3 million contract to the company for the installation of the Mobileye 560 system onboard 750 buses by the end of 2017. The detection range of the Mobileye Shield+’s three cameras. Camera 4 in this diagram is not installed. 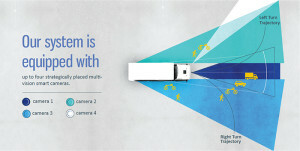 The Mobileye Shield+ Collision Avoidance System is an improvement of the existing Mobileye 560, with two additional cameras installed at the rear of the bus. Covering both the left and right sides of the vehicle, drivers are alerted to cyclists, pedestrians and motorcyclists within their blind spot while making a turn. 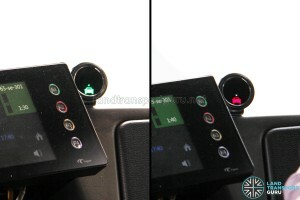 These are connected to two additional large-sized display units mounted near the left and right rear view mirrors, easily seen by Bus Captains when they glance at their mirrors. The Mobileye 560 as described in the above section is also a part of the Mobileye Shield+ system. Using a windscreen-mounted camera and dashboard display unit, it alerts drivers to vehicles, pedestrians and cyclists on the roads, while also featuring a lane departure warning. As such, the Mobileye Shield+ system utilises a total of 3 cameras. In addition, the system offers Fleet Management System (FMS) integration allowing for Intelligent Event Data Recording (EDR), and connectivity abilities with other external devices using Bluetooth wireless technology. In 2017, a unit of Mobileye Shield+ was installed onboard SBS6650K, an SBS Transit Mercedes-Benz Citaro bus allocated to Bus Service 72. The six-month trial which commenced in January 2017 allowed SBS Transit to evaluate the system on the roads before SBS Transit considers expanding the system to other buses. 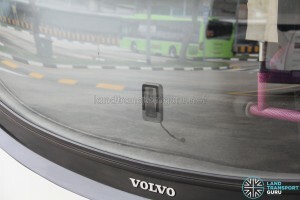 The Shield+ system is also installed onboard SG5999Z, LTA’s trial MAN Lion’s City DD Concept Bus, and SG4003D, a Volvo B8L Demonstrator. 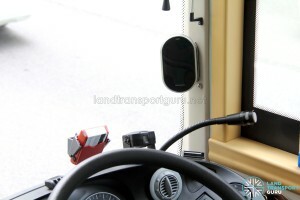 When the cameras detect cyclists, pedestrians and motorcyclists within the vehicle’s blind spot while the bus is making a turn, the driver will be alerted through the corresponding indicator display. 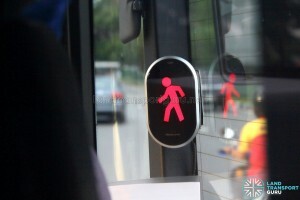 They will flash the pedestrian icon in red or yellow depending on the proximity of the potential hazard. Apart from being triggered by intended obstacles at junctions, the Mobileye Shield+ Collision Avoidance System can be triggered by passengers standing too close to the kerb edge when the bus is pulling into a bus stop, as shown in the left photo. On the right, the system responds to a faster motorcyclist taking the inner radius of a turn as both vehicles were making the same right turn at a junction. 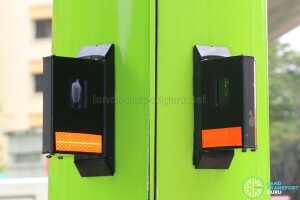 The two additional cameras can be seen in the pictures below, on both sides of the bus mounted above the tail lights. 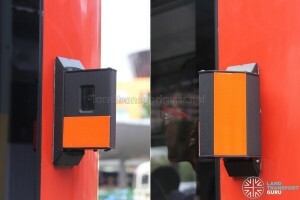 Protruding from the edge of the bus, both camera units are stickered with orange reflective tape. Subsequent installations of the Mobileye Shield+ System on public buses would see a smaller casing for the external rear-mounted camera. 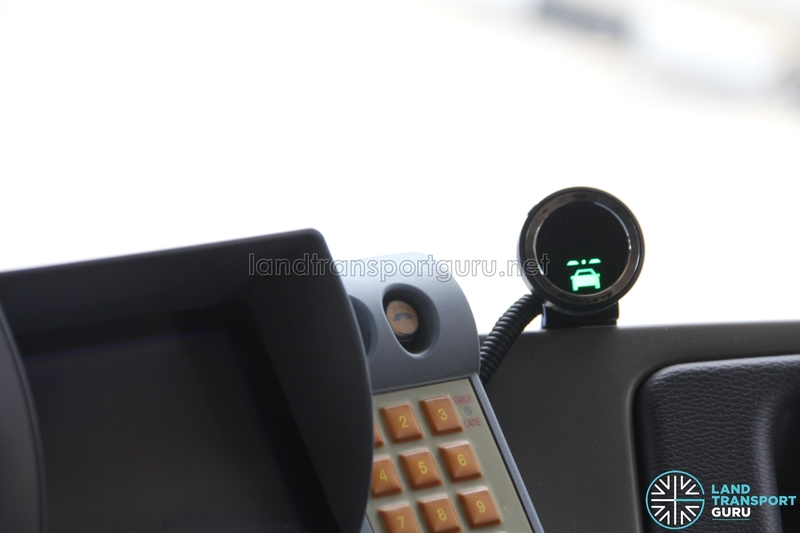 In a May 2016 press release, SBS Transit announced that 750 buses would be installed with Mobileye 560 system by that year, and more than 3,000 buses would be equipped with it by the end of Year 2018, with the eventual goal of fleet-wide implementation. 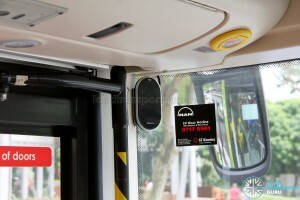 As the successful tenderer of the Seletar Bus Package, SBS Transit also announced that all buses operating on the 26 bus services included in the Package will be installed with the Mobileye 560 / 630 system. The package will consist of about 420 buses when implemented in the first half of 2018, and will grow to about 500 buses in 2023 in tandem with new developments and projected growth in ridership. SBS Transit also installed the Mobileye Collision Avoidance System on buses under the Bukit Merah Bus Package. 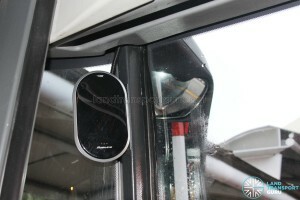 The Volvo B5LH was installed with the Mobileye Shield+ system on all buses. News Report by Lianhe Zaobao published 13 Jan 2017.